Ready-to-use camera and sensor modules for easy integration into any application to help develop miniaturized and smart products and systems with a short time-to-market. For security, robotic and consumer applications, a range of standard camera and sensor modules are available along with the 3D Intel® RealSense™ suite of cameras and modules that allow for equipping machines with human-like senses and enabling them to comprehend and interact with their environment. 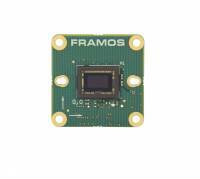 FRAMOS can help individual integrations with customized embedded vision modules. Our technical experts support choosing the right components and solutions for any application, select evaluation kits for testing, and assist with optimizing component settings. Developers and OEMs benefit from a variety of different modules with reliable hardware with additional functionalities to achieve outstanding performance in resolution, speed and image quality.